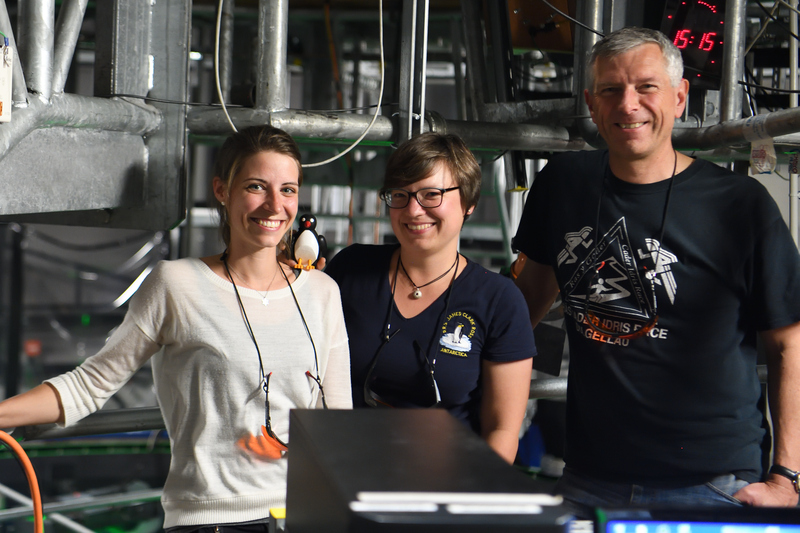 In September and October 2017, Elin and her team were in Grenoble at the 13-m-diameter rotating Coriolis platform. There are quite a few blog posts from that time, which you can find marked with the Coriolis 2017 tag. 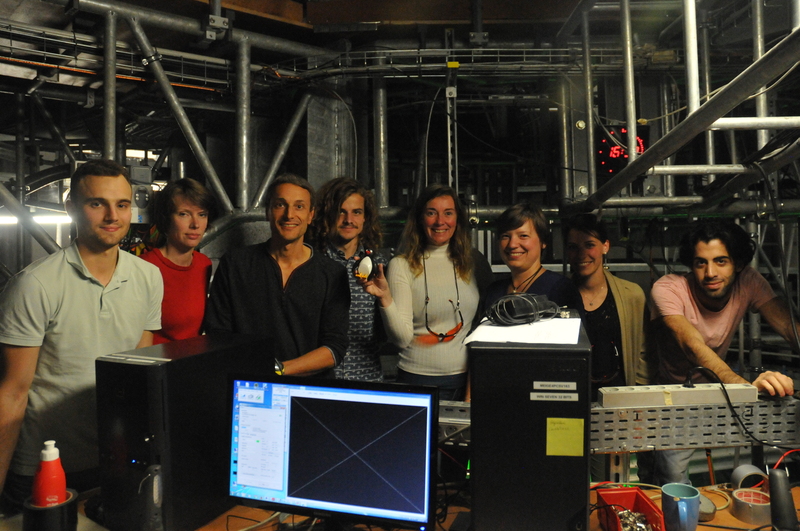 For our Grenoble-experiments in a nutshell and the team in Grenoble, continue reading below. The ice shelves fringing the Antarctic continent are melting at an accelerating rate. Most of the melt from happens from below, as warm ocean currents eat away at the ice. How exactly does this work? And how do we know? Ocean currents transport water from one place to another. With the moving water come different temperatures or nutrient concentrations, which influence the ocean locally. How ocean currents move depends on many different factors: For example how the wind or density differences drive them, how much they are influenced by the Earth’s rotation, or whether they encounter ridges or canyons underneath the sea. In this project, we investigate a specific kind of current: One that flows along the edge of a continent and then suddenly runs across a canyon. How will the canyon influence the current? Will it follow the canyon or continue on straight ahead, across the canyon? This is very difficult to investigate in the real world, because our current is located in Antarctica, where weather conditions are bad most of the year. So instead, we use a 13-meter-diameter rotating tank, filled with water, in which we place our model Antarctica and our model canyon. A source supplies the current, and we investigate how the current’s path is influenced by, among others, changes in its strength and the shape of the topography. In this second set of experiments, we are looking at the same current from the previous set of experiments, except that this time the current is set up in a way that it flows into the canyon. At the end of the canyon, we have added an ice shelf. The ice shelf either “floats” on the water (so it sits right at the water surface) or reach further down into the water until it rests on the edges of the canyon. Now we expect that the deeper down the ice shelf reaches, the more it will influence the current, which, when subjected to a sudden depth change, should change direction instead of following the current and flow underneath the ice shelf. 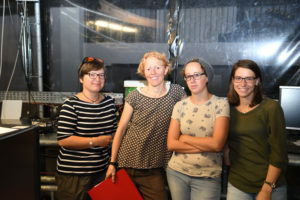 But again, this probably depends on how strong the current is, so we change the flow rate of the source to investigate. Both these sets of experiments are not only exciting for us, but also important: If the current (or large parts of it) were moving into the canyon and then underneath the ice shelf, the warmer water would contribute to the ice shelf’s melt. This has consequences not only for the ice shelf (which would shrink), but the melt water introduced to the ocean would change ocean currents, which, in turn, might have an influence on climate. It is therefore important to understand this system in our tank, so we can use that understanding to figure out what is going on in the real world, how well models represent the real world, and how it all might change. 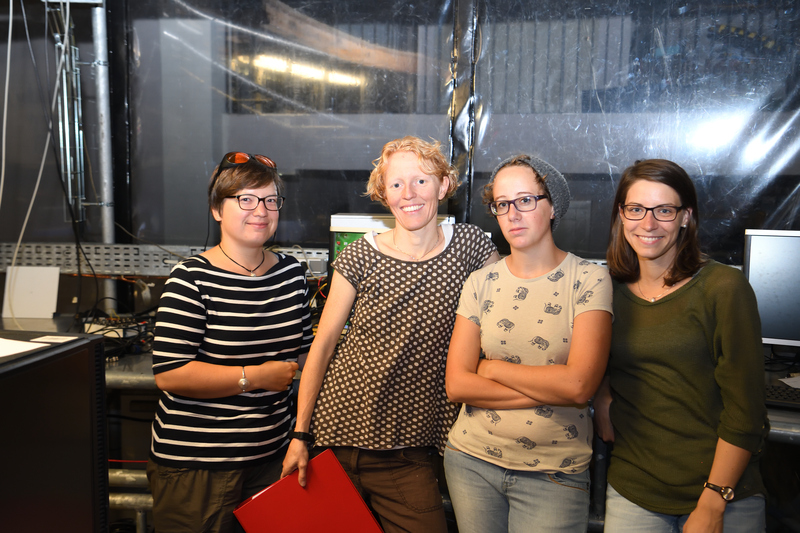 The first team: Mirjam Glessmer, Elin Darelius, Lucie Vigne, Nadine Steiger (from left to right). Picture by Samuel Viboud.